There’s no doubt that everybody is excited for the opening night on the 2019 Flamboro Speedway schedule. Though beyond that, it promises to be a busy summer with lots going on from the first weekend in May, to the Halloween Enduro in October. As you begin to plan what you’re doing this summer, here are five things that you should keep in mind. Although known as a touring class the past couple seasons, the Canadian Vintage Modifieds will call Flamboro Speedway their home for the 2019 campaign. The decision was made by series officials as an attempt to allow the division to focus back on its roots. The Canadian Vintage Modifieds will be in action on 12 different nights throughout the summer, beginning with May 11. Notably, they will crown their mid-season champion on July 13, with the division title given out on September 14. The crown jewel for the Grisdale Racing Products Late Models will see a new format this year, with three separate 100 lap races ran throughout the summer with their own points standings crowning the 2019 Grisdale Triple Crown Champion. You are going to want to be in attendance for each of these races, as the best Pro Late Model drivers from across the province will want to be a part of the action. The three races are currently scheduled for May 25, August 10, and October 6. One of the highlights during the season every year is the Flamboro Memorial Night, which honors past competitors throughout the night. This year’s edition will be held on September 7, featuring an on-track autograph session and corn roast. The action promises to be full of excitement on-track with the Grisdale Race Products Pro Late Models, Ray’s Auto Towing & Recovery Super Stocks, Klotz Auto Repair & Engine Machine Shop Mini Stocks, McClurkin Properties Cambridge Pure Stocks, Ontario Pro Challenge, and Canadian Vintage Modifieds all in action that night. In an effort to continue to grow the Ray’s Auto Towing & Recovery Super Stocks, there is a new incentive being offered to the drivers. Each night at the driver’s meeting, all competitors in attendance will see their name put in a hat, with one name drawn to win a free tire. 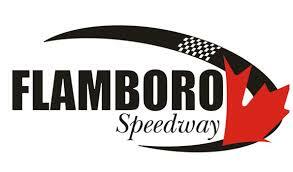 Thus far, Flamboro Speedway has received sponsorship of the tire giveaway for 10 of the 13 nights on the calendar. Anybody interested in sponsoring the final three is encouraged to get a hold of the speedway. Flamboro Speedway is proud to play host to the third annual Great Canadian Truck Show, allowing attendees to get up-and-close to a variety of trucks. From checking out the different vehicles, to speaking with the drivers about features, it gives the truck enthusiast a new view of the vehicles they’re amazed with. Right smack dab in the middle on Saturday night, the speedway will play host to the Don Biederman Memorial, featuring 75 laps for the Ontario Outlaw Super Late Models. Additionally, the Queenston Chevrolet OSCAAR Modifieds, Living Lighting OSCAAR Pro Sprints, Canadian Vintage Modifieds, and McClurkin Properties Cambridge Pure Stocks will all be in-action, as well.